As we near the end of the year, I reflect on the year that was and the highlights for both Al Tamimi & Company and the legal industry in the Middle East. This month we celebrate a number of achievements for the firm which I am proud to highlight. The first is the celebration of 20 years of Law Update. As you can appreciate, publishing such an extensive legal magazine each month can be a challenge however, we have remained committed to this and will continue to remain committed to bringing you the latest in legal developments as interpreted by my team of lawyers. 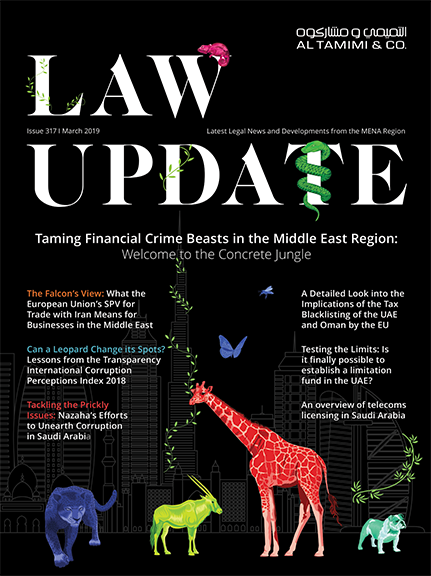 I have to congratulate our founding partner, Essam Al Tamimi for having the vision to produce such a newsletter 20 years ago and for his commitment to ensuring that Law Update evolved to be a relevant and informative publication for clients and colleagues alike. I’m also very proud to wrap up the year with the announcement that on 1st , Al Tamimi & Company were awarded ‘Middle East and African Law Firm of the Year’ at the British Legal Awards in London. As one of the most prestigious awards in the legal industry, it is an honor to receive this and be recognized as leaders in our market. This of course has been supported by our visible growth in the region over the past 12 months. The award is one of many accolades we received throughout 2011 including ‘UAE Law Firm of the Year’ at the IFLR Middle East Awards and winners of seven prestigious categories in the UAE Asian-Mena Counsel Corporate Asia & Middle East Survey . It is without doubt that 2011 was an exciting time for our profession with the IBA holding their annual conference here in Dubai. With over 5500 delegates, making this the biggest conference held by the IBA, you will agree that this was a week filled with opportunities from both a professional development and networking perspective. Many new relationships were formed and of course many existing ones rekindled. We thoroughly enjoyed hosting many friends from all over the world at our seminars and cocktail reception and hope you enjoy the collection of photos we’ve highlighted this month.